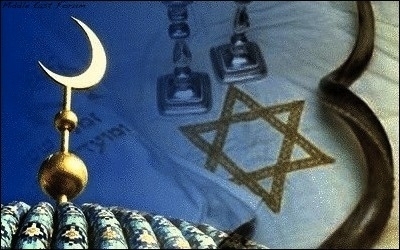 The main holy days in the Jewish and Islamic calendars align in mid-September. This year - 2015 by the common era (C.E.) calendar - includes an alignment at mid-September of the main holy days in the Jewish and Islamic calendars. At sundown on September 13, Jews observed the first of their High Holy Days, and their recognized commencement of the new year, Rosh Hashanah (first and second days of the month of Tishrei for the Hebrew year 5776). After 10 days, Jews will observe Yom Kippur, the Day of Atonement, beginning at sundown on September 22. Muslims will participate in Hajj, during which pilgrims who are able to do so and can afford it, will travel to Mecca. The rituals in the holy city will begin on the eighth day of the hajj month, Zu'l Hijjah, for the Islamic hijri year 1436, corresponding to September 20, according to lunar observation. Hajj will end on the evening of September 24. Muslims will then celebrate Eid ul-Adha or Kurban Bayram, the feast of sacrifice. The intersection of the Jewish and Muslim holy days is not an annual occurrence. Both the Jewish and Islamic religious calendars originated in lunar, rather than solar cycles. But lunar calendars fall short of the solar calendar. The Jews solved this problem by intercalation, or insertion of an extra month of 30 days to the annual calendar, seven times in 19 years. This brought the Hebrew calendar close to the solar cycle and to the passage of the seasons for agriculture. Muslims and Jews should reflect on the lessons of their long coexistence in the Middle East. The Islamic hijri calendar is also intercalated, but only by the addition of one day, 11 times in a 30-year period. This leaves the Islamic calendar with 354 days, or 11 short, in most years. The Islamic calendar and its holy days therefore appear at least 11 days before the corresponding days in the common era and Hebrew calendars, retrocessively. For example, Kurban Bayram fell on October 4, 2014, and October 14, 2013. As different as the two calendars - and their Western, secular counterparts - have become over the centuries, the Jewish and Muslim calendars offer similar opportunities for spiritual reflection. The Jews of Medina fasted on Yom Kippur, as Jews around the world do today, and it is said that Prophet Muhammad, peace be upon him, was inspired by the sight of their practice to call for the full month of Ramadan fasting. Unlike the Jewish New Year cycle, however, Hajj is structured around events in the life of Hajjar (Hagar) the concubine of Ibrahim (Abraham) and their son Ismail (Ishmael). During Hajj, Muslims celebrate events that occurred when Hajjar left the camp of Ibrahim and arrived with her son at Mecca. These include running back and forth between the two hills of Al-Safa and Al-Marwah, as Hajjar ran desperately seeking water for Ismail, and drinking from the well of Zam Zam, which was found by Ismail. The unifying figure of Abraham/Ibrahim for the monotheistic religions is widely understood today. But as the Jewish High Holy Days and the Islamic Hajj begin in proximity to one another, both communities should reflect on the lessons of their long coexistence in the Middle East. Ordinary Jews and Muslims alike want peace. Working to make conciliation between Judaism and Islam a reality will fulfill the sacred duties imposed both by Yom Kippur and Hajj. Appropriate activities at the time when the holy days of the two religions intersect include personal study of one another's sacred texts, commentaries on them, and prayers and recitations for an end to interreligious violence. Mutual good wishes may also be exchanged. At this time, when the world is wracked by bloodshed, nothing could be more expressive of the essential Abrahamic message.